Amazingly, Elon Musk confirmed my wild guesses about their new Volkswagen Microbus-inspired Tesla minibus. And perhaps even more amazingly, he seems to have taken a suggestion from another Twitterist about what to call such a vehicle: Spacebus. Yep. 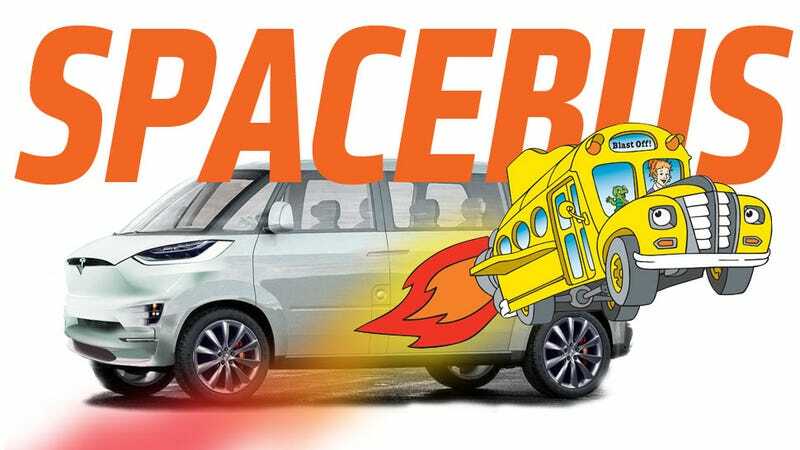 Spacebus. See that? He’s calling it a Spacebus now. I mean, it makes sense, since the guy does also have a company that builds, you know, actual spaceships, and I’m really hoping this thing gets to market retaining that delightfully goofy Spacebus name. This is a good pedigree. If old Volkswagen Microbuses aren’t enough funky old van inspiration, I can’t think of anything better than a ‘70s Dodge Spacevan. Sometimes it’s called a “Rocket Bus” or “Moon Rocket Bus” but, whatever, it’s close enough to Spacebus. Now that’s a space bus.